Discover some of the many production challenges concept artists face during the production of video games, and how to overcome them. 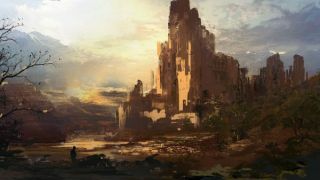 Concept artists play an important role in the development of video games. They’re the bridge between the art director's vision of the game and the artists who produce the in-game assets. They're responsible for making sure that the concept art tasks follow the designated production schedule; showcase the established design pillars that have been established early on; and track down relevant production information from other departments if this is missing. As a lead concept artist, my team and I face exciting and fun challenges every day. Not only do we need to embrace the technology changes within the digital painting process and learn new software, we're also expected to continuously grow as artists by practising traditional drawing and painting techniques. Here, I want to discuss in detail the role of a concept artist within a video game production, and the significant impact this role has on the game's finished look. Hopefully it'll inspire you to channel your efforts into breaking into the games industry, or if you're already a busy concept artist, help you to up your game! Concept artists are the link between the art directors and the 3D artists. We have the crucial role of reinforcing the established art pillars through our work and having daily conversations with the 3D artists. This is the bread and the butter of our job. You should know the check list of the visual benchmarks like the back of your hand. Your art director should be an integral part of the concept art process. Don't submit the final piece of artwork without going through your design process with them first. Talk about how you'll be approaching a shot, and then continue with composition sketches and colour palette proposals, and then show the final artworks. Not only will the art director give you valuable insights, but you'll also be able to explain and justify the thought process behind your aesthetic choices, which may lead to further discussions. Photo references are the foundation that will generate realism in all your works. Even sci-fi video games will feature a significant amount of real-world designs. References increase the soundness of your artistic choices and show that you've done your visual research properly. They also serve as great visual support when your deadline is tight and you have to do something loose. Provide the reference materials along with your speed painting: this will make the 3D artists' lives much easier. Before the level artists start a big map, they need some visual prompts to get things rolling. It can be looking through photos together, navigating in the game engine, or providing sketches to give a general direction of how the silhouette of the map should be approached. A sketch can generate ideas and iterations can be done quickly. Many level artists like this type of interaction, because they're directly involved in the design phase of their assigned map. Lighting has a strong influence on how your concept art will be interpreted in the game. Make sure you sync with the lighting crew and seek their feedback. If your shot is dependent on the time of day or specific lighting fixtures, the shadow shape or how the light diffuses can affect your composition. Lighting artists can let you know how much artistic freedom you would have based on engine constraints and how you can use that freedom more efficiently. Highly rendered concept art, with lots of mood, ambiance and VFX, doesn't always help the level artists. They usually need clarification on modelling and texturing. Listen to their requirements before deciding on what kind of concept art you'll be generating. A piece of line art or a material chart can be more efficient for delivering design clarity. A production has a limited budget and timeline, so you need to use all the available tools to be productive and efficient. If a 3D screenshot can help you to nail the perspective faster and more clearly, go for it. If render passes can speed up the process of polishing high-level concept art, don't hesitate. If you need in-game assets to be part of your concepts, ask a level artist to export those objects. You need to be a fast thinker and a pro-active team player. Deadlines are crucial within the production process, especially when a lot is dependent on concept art being created at the beginning of the pipeline. Missing the deadline can affect all the departments that have scheduled their tasks based on the date of completion of the concept pieces. It's important to let others know as soon as possible that you might miss the deadline, so that alternative approaches can be discussed, such as a looser rendering level with supporting references, or start the task with the available in-game assets instead of painting from scratch. Not sure about something? Ask for more details! Some shots might have size or navigation constraints. If in doubt, ask. Level designers are always there to answers such questions. If the purpose of a task isn't clear, ask which department will benefit from the artwork. This will enable you to gather information about their needs. If the deadline isn't specified, ask for details so that you can plan your painting process accordingly. Concept art can trigger fresh ideas for the VFX team, so keep them in the loop. While we provide level artists modelling, texturing and layout information through concept art, we also need the VFX team's support on the realisation of the ambiance and the mood portrayed in the concept art. What kind of smoke, fire or steam effects will suit certain maps? Effects artists are the experts, and can provide you the most accurate answers. Don't keep everything to yourself; share and enjoy! I believe that a culture of sharing is the key to ensuring that a concept artist progresses artistically and technically within the production. It can be custom-made brushes, 3D components, cool plugins, nice cut-out shapes or relevant photo packs. Sharing those tools can make our work more consistent in terms of quality and it can avoid repetitious art tasks. If one artist cut out 10 types of vegetation from references, it doesn't make any sense that another concept artist should spend time cutting out the same elements. Sharing tools and resources can give you more time to concentrate on the areas that need your design talents, instead of tackling run-of-the-mill art tasks. Your colleagues are your best advisers, because they know the production requirements and you see them on a daily basis. They can also provide you with bonus information or materials that you wouldn't expect if they happen to be are working on some shots that are relevant to yours. Furthermore, the fact that all the concept artist share a similar vocabulary, in terms of composition, value, colour and lighting, will make the feedback sessions smooth and efficient. Any video game production is expensive and complex, and the concept art aspect is only one of the many important cogs in this machine. Your concept art is a tool to deliver the final game product, rather than being a finished product in its own right. Yes, there's a quality bar to reach, but your concepts aren't fine art masterpieces that you can spend hours polishing to perfection. You need to learn when to stop. Being an idealist in this environment can have a negative impact, both on your work productivity and on the project's schedule. All artists have a gut instinct to make their work as visually appealing as possible. However, it can help to shift this point of view when it comes to evaluating the worth of concept art pieces. A concept artist may deliver a piece of line work that has a significant impact on the level artist's task. You could then say that the line work has a high production value, because it makes a strong contribution to the overall production efficiency across different departments. This article originally appeared in issue 134 of ImagineFX; buy it here!